Medrock Medical P.C (New York) - Book Appointment Online! Is a multi-specialty rehab clinic combining chiropractic care, physical therapy, and Board-certified medical doctors for optimum results. Our integrated treatment approach is geared to benefit you in all aspects of pain-relief and spinal correction. With a strong focus on manual “hands on” treatment, our specialists work together to formulate efficient, customized treatment plans for each individual patient. We pride ourselves on establishing accurate, complete diagnoses whereby the most appropriate care may be provided. 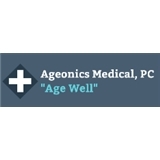 The board certified professionals at Ageonics Medical specialize in musculoskeletal joint pain. Upon complete assessment of your present condition, our three main areas of focus surround bone, muscle, and nerve. Precise determination how each of these components may be contributing to your diagnosis is critical in our ability to eliminate pain. I appreciate how Dr. Gelb took her time and was thorough. She's very sweet and made the visit a pleasure. The girls at the front desk were also very friendly and helpful. Great environment! AMAZING EXPERIENCE! He has MAGIC HANDS! Wow...highly recommended!! Very professional, thorough , excellent all around doctor. I’m very happy to have found him. Very personal and approachable. Plan to stay in this practice!